Combining resources. That seemingly simple formula might prove to be a key to unlocking the commercial potential of northwestern British Columbia’s forests. The recently created Northwest B.C. Forest Coalition has adopted a co-operative approach toward marketing the region’s forest resource. Twelve companies and organizations between the Hazeltons and Prince Rupert have pooled their timber cutting rights and expertise to better appeal to potential investors in the sawmilling and bioenergy industries. The response to the initiative is reportedly very positive. The coalition members can collectively offer up to 2.7 million cubic metres of timber annually. It’s part of the province’s largest uncommitted wood basket. The nature of the region’s timber resource is a primary reason for the under-utilization. Provincial regulations require forest companies to harvest the entire forest profile. It means taking the chaff with the wheat and in much of the northwest region there’s altogether too much chaff. The mixed wood species of regional forests are characterized by large volumes of poor quality and over-mature timber stands. 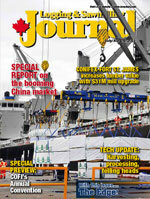 Logging and transportation costs soar like the surrounding mountains. The combination of factors has contributed to the failure of several well-meant regional forestry endeavours in recent decades. The Northwest B.C. Forest Coalition members hope to provide the catalyst to reverse the trend. What might make the difference this time around is the wood volume available and the emergence of the bioenergy sector. Sawmills producing dimension lumber prefer sound timber but most bioenergy projects can utilize any form and quality of wood fibre. Bell’s observations resonated. “Working collectively as a group, we took the ball and ran with it,” recalls Norm Parry, timber sales manager for the Skeena Business Area of the provincial ministry of forests, lands and natural resource operations in Terrace. 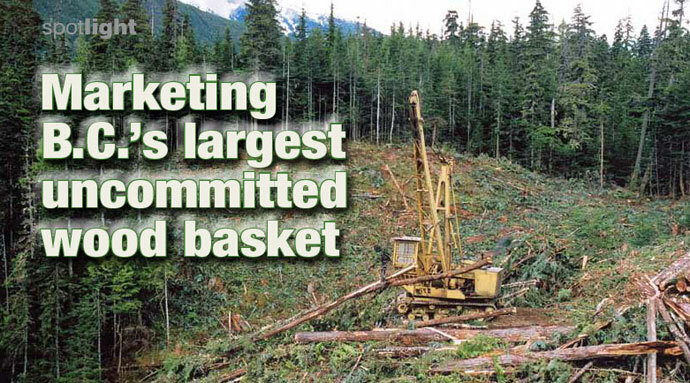 The Skeena Business Area’s timber sales contribute about a million cubic metres to the coalition’s fibre pot. The coalition first established its governance—terms of reference—and then launched its web site, www.nwbc-forestcoalition.org, to market itself. The coalition is also part of Fibre Connections BC, a provincial information clearing house for companies looking to access timber. “We recognized it would take time but the response has been very positive,” reports Parry. The way the process works is interested parties and potential investors can make a presentation to the coalition’s members about what types and amounts of wood fibre they require. “Then it’s up to the players to take it from there,” he says. The coalition anticipates increasing interest in the region’s fibre source as the forest industry specifically and the economy generally continue their gradual recovery from the recession. “The apparatus is set up. Our task now is to make sure we’re open for business and prepared for new opportunities,” summarizes Parry. Elmer Derrick, coalition leader and a treaty negotiator with the Gitxsan was unavailable for comment at press time. The coalition’s optimism for the region’s forest industry future is mirrored by parallel developments and proposals in the northwest. Coast Tsimshian Resources, which is a coalition member, has announced a proposal to establish a bio coal plant in Terrace. The estimated $30 million plant is a partnership with Global Bio-Coal of Vancouver and Rotowave Targeted Energy System in the U.K. The project requires between 300,000 and 350,000 cubic metres of fibre annually to produce 120,000 tonnes of bio coal. The plant will be built on Coast Tsimshian land in Terrace and employ 120 people indirectly and 20 in the plant. Coast Tsimshian holds two forest tenures totaling about 550,000 cubic metres annually and owns a 59 hectare log sort yard in downtown Terrace where the proposed bio coal plant will be located. Coast Tsimshian’s woodlands operations are managed by Brinkman Forest Ltd., from Terrace. The city is also one of two proposed locations for a wood pellet manufacturing plant. Together with another at Meziadin Junction on Highway 37, the U.S.-based Biomass Secure Power pellet plants would have an estimated combined capacity of up to 250,000 tons/year. Construction is slated to begin this fall with production beginning in 2012. Meziadin Junction is along the corridor where the $404 million Northwest Transmission Line is under construction, to hook the area up to the provincial electrical power grid. The mothballed Kitwanga Lumber Mill has been dusted off and is back producing lumber with demand from China helping drive the re-opening. Kitwanga is about 90 kilometres northeast of Terrace adjacent to Highway 16. The operation was acquired out of receivership in 2009 by Pacific Bioenergy Corp., of Prince George. The company hopes to build a wood pellet manufacturing plant adjacent to the sawmill. Pacific Bionenergy plans to have it operational in the spring of 2012 with the production split between China (about 60 per cent) and Canada. Meanwhile, in another recent development, CORE BioFuel Inc. is moving toward constructing a green gasoline biorefinery based on wood stock. The preferred B.C. location for the refinery appears to be Houston, about 35 kilometres east of Smithers in west central B.C. No firm timelines had been announced. The realization of the Northwest B.C. Forest Coalition aspirations and the maturation of some of these other projects would transform the region from a backwater to a provincial showcase for forest industry diversification and wood fibre utilization.